Turkey Hill Minit Markets in Pennsylvania are installing blue lights in their bathrooms to prevent people from using drugs in them. The blue lights make it harder for people to see their veins. 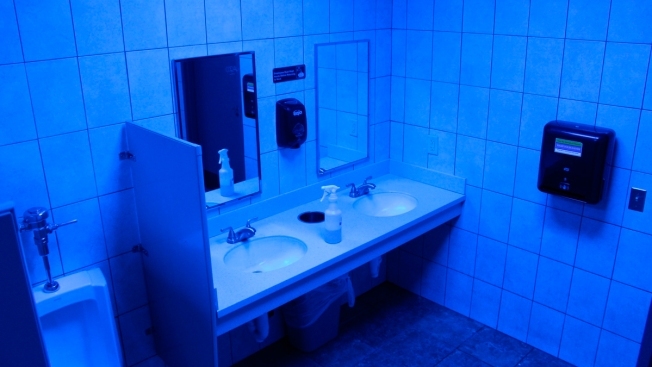 Colored bulbs cast an eerie blue glow in the restroom of a Pennsylvania convenience store where people who inject heroin and other drugs have been seeking the relative privacy of the stalls to shoot up. "The hardest-core opiate user still wants to be accurate. They want to make sure the needle goes in the right spot,'' said Read Hayes, a University of Florida researcher and director of the Loss Prevention Research Council, a retail industry-supported group that is looking at the lights' effectiveness. The purpose of the blue light is to "disrupt that process'' and force people to go somewhere else to take drugs, he said. Earlier studies have questioned the lights' deterrent effect, with people who use opioids telling researchers they'd shoot up in blue light if it meant avoiding withdrawal symptoms. Many public health experts oppose the practice, saying blue lights make people more likely to hurt themselves and stigmatize those in the grips of addiction. And, for people accustomed to injecting themselves, there are ways around the lights. Someone in withdrawal who obtains heroin is "going to want to use as soon as possible, even if the location is not optimal,'' said Brett Wolfson-Stofko at the National Development & Research Institutes, who has studied injection drug use in public bathrooms. Store owners say they have to do something. In Luzerne County, where Turkey Hill has installed blue lights at a store in Wilkes-Barre, Coroner William Lisman said people have died from overdoses in the public bathrooms of fast-food restaurants, big-box stores and other retailers. At some Turkey Hill locations in hard-hit neighborhoods, store workers would often find used needles or even people slumped over from an overdose, said Matt Dorgan, the chain's asset protection manager. "We realized we need to do something to protect our associates and our customers,'' he said. The blue lights were part of a broader set of security measures at Turkey Hill that included brighter exterior lighting, new window signage to make store exteriors more visible from inside, and security training for store workers. Last fall, Sheetz, a convenience-store chain with more than 500 stores in six states, installed a new lighting system in the restroom of its New Kensington store, about 20 miles outside Pittsburgh. The blue lights are "designed to help our customers and employees avoid dangerous situations,'' said company spokesman Nick Ruffner. Sheetz, he said, has seen "positive steps in the right direction,'' and has since installed the blue bulbs at a store in Huntington, West Virginia. Some health experts encourage interventions that don't involve blue lights. Installation of needle disposal containers can help protect store employees, the public and people who use drugs, while stall doors that swing outward can make it easier to reach someone who has overdosed and is in need of medical help. Stores can also work with law enforcement, social service agencies and addiction services to tackle the problem a step that Hayes, at the loss prevention council, said retailers are looking to take. Retailers aren't the only ones experimenting with blue lights. The city of Philadelphia began distributing kits to residents that include a blue bulb for the front porch, no-trespassing signs, a tool to pick up used syringes, a needle disposal box and contact information for social services. The city, where overdose deaths, fueled by the powerful synthetic opioid fentanyl, surged more than 30 percent to 1,200 last year, has given out more than 100 kits since January.